We proudly announced the birth of our child via email to our friends and family. My mother thinks it is proper etiquette to mail a formal birth announcement (in addition to the email.) Is this really necessary? Your mother, your mother’s friends and your friends and family would love to receive a beautiful birth announcement for your new baby. Hanging an email printout on the fridge just isn’t the same. What exactly do I include on the birth announcements? Oh, the fun of announcing your new arrival. 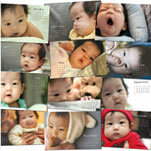 You’ll want to include the baby’s first name and middle name, the birth date, and baby’s weight and length. Finally, include the parent’s names and any sibling’s names. Who should I send birth announcements to? Send an announcement to everyone who would be thrilled to know you’ve had a baby. This would include your relatives, close friends and close friends of your parents and in-laws. 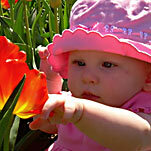 When should I mail the birth announcements? You’ll want to choose a design during the last month of your pregnancy. Then when baby arrives, you’ll just need to fill in the details (date, weight and length) and order the announcements. Obviously, you’ll be a bit pre-occupied the first few weeks after baby arrives, but you have up to six months to send out the announcements. Experiment with your name choices and find a card that matches beautifully. If someone has already sent a baby gift do I need to send them a birth announcement? Someone who managed to send you a gift even before you sent out announcements is ESPECIALLY deserving of a beautiful birth announcement. 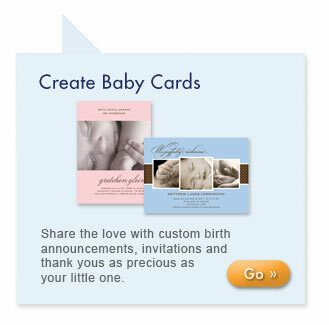 You might also consider sending a baby thank you card featuring a picture of your baby instead. We received many lovely baby gifts, but I have no time to write thank-you notes? Is being a new mom a good excuse for not writing thank-you notes? It’s never too late to express your gratitude for those tiny booties and soft blankies. Most people will understand if your thank-you notes arrive a bit late given what else is going on in your life right now. I’d love to have my friends and family celebrate my second born, but I’ve heard it’s not proper to have a baby shower for a second child? What’s a mom to do? Why not have a Sip n’ See, a lovely Southern tradition. After your baby’s born, invite close friends and family over and serve something for them to “sip” while they “see” the new baby. Where’s the best place for me to get beautiful baby shower invitations, charming baby thank yous and adorable birth announcements in one place? 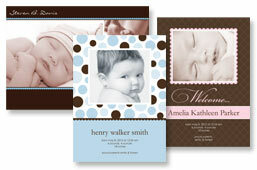 Shop now for birth announcements and baby stationery. Now you can coordinate your baby birth announcements, address labels and thank you cards with our new stationery collection. A thank you card is that much more meaningful with your little guy’s sweet smile front and center.